The 2013 Black Heritage Stamp featuring Ms. Rosa Parks, the Mother of the Civil Rights Movement, will be unveiled on MON, 4 FEB 2013 in Detroit MI at the Charles H. Wright Museum of African American History. MON will mark the 100th Birthday Celebration for Ms. Parks (1913-2005). 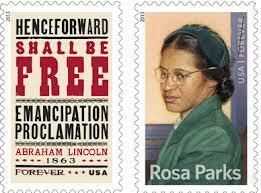 The Rosa Parks Stamp will be the 2nd commemorative stamp in the Civil Rights Series this year. The 150th anniversary of the Emancipation Proclamation is the 1st in the Civil Rights Series and was unveiled today in Greensboro NC at the International Civil Rights Center and Museum. We can never forget Ms. Claudette Colvin, “The 1st Rosa Parks”, who at the age of 15, refused to give up her seat on a Montgomery bus on 2 MAR 1955 just 9 months before Ms. Rosa Parks -1 DEC 1955. Ms. Colvin was a member of the NAACP’s Youth Council and was advised by Rosa Parks. However, she was not old enough nor did she meet the criteria needed to represent the start of such a profound movement. Interesting! And, we MUST remember Ms. Ella J. Baker (1903-1986), one of the most key Black Women Leaders of the 20th century, who worked behind the scenes and closely with many of our black male leaders of the Civil Rights Movement. She organized and served as director of the Young Negroes Cooperative League (YNCL) in NY, became a national director for the National Association for the Advancement of Colored People (NAACP), a founder of the group In Friendship (which raised money for the Montgomery bus boycott) in 1955, a founder and 1st director of the Southern Christian Leadership Conference (SCLC) in 1957 and a key creator and adviser to the Student Nonviolent Coordinating Committee (SNCC) in 1960. Wonderful to know Ms. Ella Josephine Baker was honored in the Civil Rights Pioneer Stamp series highlighting the 100th Anniversary of the NAACP in FEB 2009.